At lunchtime today, Alex Neil Scotland’s Minister for Housing and Communities launched a major new housing development in the Ayrshire village of Tarbolton. The project is being taken forward by the Ayrshire housebuilder Hope Homes in partnership with the housing association Ayrshire Housing. On completion, 126 houses will have been built for sale and 30 for affordable rent. Mr Neil said “I have long recognised the quality and commitment of these two Ayrshire companies. I’m pleased that the Government has been able to use its support for the affordable element to complement Hope Homes’ own efforts to provide much needed new homes for sale to the village and with it local construction jobs”. Pearl Boyd Ayrshire Housing’s vice chair also welcomed the continued support of South Ayrshire Council for her Board’s efforts to provide much needed new housing. She was pleased that local Councillor John Allan had been joined by Councillor Hugh Hunter, the former Council leader, and Mairi Low who is one of the Council representatives on Ayrshire Housing’s Board. Ian Hope of Hope Homes said “Hope Homes and Ayrshire Housing have a longstanding relationship in terms of affordable housing. Projects have already been completed at Dalrymple and Maybole. Beyond Tarbolton, further partnership developments are planned for Fisherton and, as part of a wider regeneration initiative, in Ayr. 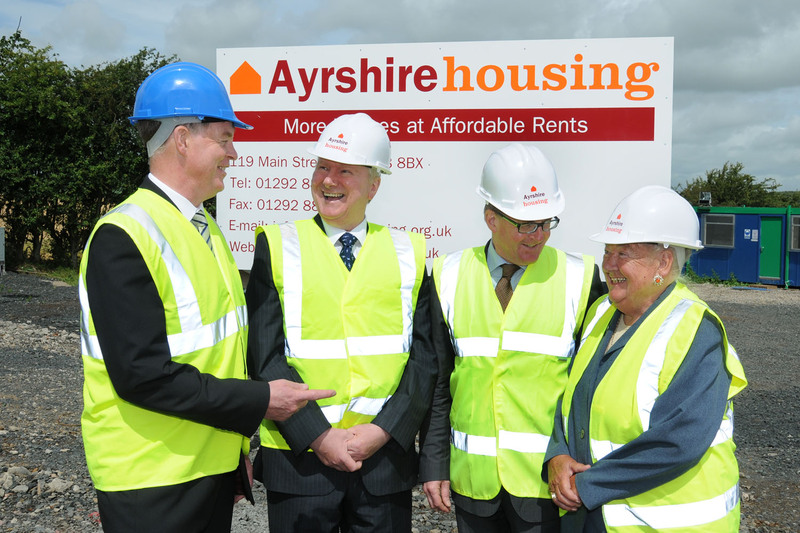 Earlier in the day, Mr Neil announced that an extra £1.5 millions will be released this year to Ayrshire’s network of housing associations. This is on top of more support for the new Council house building. 126 houses for sale are planned in four phases. In the first phase of 27, 14 are sold and occupied with a further 5 reserved. A shared equity option is available on application. The 30 houses for rent have been designed by Ayr based Lawrence McPherson Associates to both meet Ayrshire Housing’s own requirements and to be integrated with Hope Homes’ planning scheme. On completion early next year, 18 four person and 12 six person houses will be available for let. 4 of the six person houses are especially suited to wheelchair users. Hope Homes Scotland was founded in 1990 by Scott Hope, Anne Hope and Ian Hope. Combining their experience in different areas of business, they have developed a company which has an enviable reputation. They have become well a regarded business in bringing forward affordable high quality developments to Ayrshire’s small burghs and villages. It has successfully addressed a market niche largely ignored by the volume builders. They are now working with the Prince’s Foundation for the Built Environment on the Knockroon development as well as on a number of other projects. The 30 houses for rent represent an investment of £4m. This has been made possible by a Scottish Government Grant of £2.3 m. In addition, South Ayrshire Council made available a grant of £80,000 which has allowed four of the houses to be built to wheelchair standard. See an earlier post about this project.